Although red light cameras can be an effective traffic-safety tool, many consumers are suspicious of them, suspecting that money lifted from motorists isn't going where it's supposed to. Case in point: Karen L. Finley, 57, of Cave Creek, Arizona, a posh foothills village that was once the winter home of the late radio commentator Paul Harvey. She was sentenced yesterday to 14 months in federal prison. Finley had a good thing going. 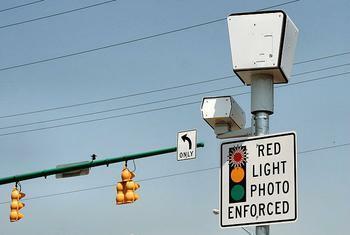 She was the CEO of a red light camera enforcement company that operated cameras in Ohio. Like most such cameras, Finley's firm operated the cameras, notified violators, and collected their money. But according to the U.S. Justice Department, during the years from 2005 to 2013, Finley was part of a scheme in which the company funneled campaign contributions to elected public officials in Columbus and Cincinnati through John Raphael, a consultant retained by the company. The deal was that the public officials would help Finley's company get municipal contracts, including a red light pact with Columbus, prosecutors said. They state Finley also admitted that she and her co-conspirators concealed the true nature and source of the payments by Raphael and the company’s payment of false invoices for “consulting services,” which funds Raphael then provided to the campaigns of the elected public officials. Finley was sentenced yesterday before U.S. District Judge Michael H. Watson of the Southern District of Ohio. She pleaded guilty on June 19, 2015, to one count of conspiracy to commit federal programs bribery and honest services wire and mail fraud. Finley cooperated with the government’s investigation and testified against John Raphael, an Ohio lobbyist, who pleaded guilty to one count of violating the Hobbs Act for his involvement in the scheme. On June 8, Raphael was sentenced to serve 15 months in prison.